The experiments on the dyeing of spine materials for the Daubeny slotting programme has taken up my time and almost all my thought since my last post on this project. This is due to it being uncharted waters for me and the criteria being fairly demanding. I needed a process that was simple and could be achieved in a normal studio setting with the equipment available, and which provided a strong depth of shade using a dye recipe that was easy to accurately replicate. As the Daubeny books are stored on open shelving good light fastness was also important. Finally, I did not want a dye which altered the texture or handling properties of the aerocotton chosen for the new spine material. This search for the holy grail of toning and dyestuffs was quickly narrowed down to 2 dye systems: direct and reactive dyes. 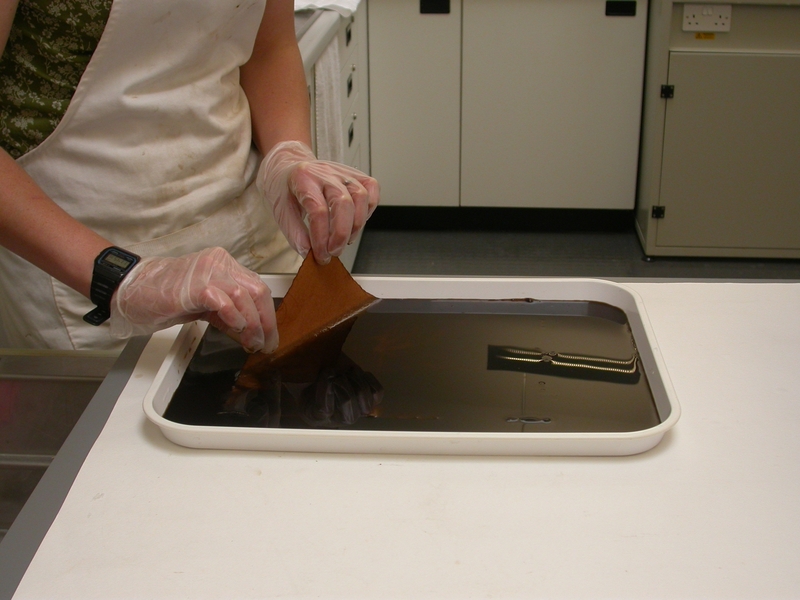 Direct dyes, specifically the Ciba-Geigy direct dye Solophenyl, are used extensively by textile conservators. They have excellent reproducibility and light fastness but their relatively low wet fastness is an issue. They also require heat and pH monitoring during the dye cycle leading to a reasonably elaborate procedure. Reactive dyes, such as Procion MX and Cibaron, or its new incarnation Novacron, are highly solvent resistant due to the strong covalent bond they form between the dye and the fibre. The dye cycle does not necessarily require heat as the dye is extremely reactive under normal ambient conditions. This category of dyes have fair to very good light fastness, with the reds being the poorest. However, this is so with all dyes types. On the negative side, the highly reactive nature of the dyes can make them difficult to reproduce accurately and can cause unevenness in colour, or unlevellness, across the textile. Having worked with collections stored in historic buildings I was all too aware of the water based events that can occur involving library and archive materials. Also, having attended a course on dyeing, arranged by the Textile Group of Icon at the much mourned Textile Conservation Centre (TCC), and witnessed first hand the relatively complicated procedure involved in using direct dyes, I knew reactive dyes were the way forward. 1. Wetting out: it is important that the fabric is thoroughly wetted before making contact with the dye bath to ensure even uptake into the fibre. 2. The thorough mixing of the salt in the dye solution is also crucial. The sodium sulphate used is very reluctant to dissolve, and the course information from the TCC recommends making a strong solution of the salt and adding that the dye bath, rather than trying to dissolve it in the bath itself. 3. Agitation: you can not rock the dye bath to much! 4. Rinsing and drying: the smallest amount of residual dye can cause unlevellness, so thorough rinsing in hot water to include a brisk boil wash for around 5 minutes is also important to achieve even dyeing. With regard to light fastness, the 3 colours I am using have fairly good to very good light fastness. I have set up light tests on my samples and will report in due course. Finally, with regards to the inconsistencies in colour reproduction, I am looking into more accurate methods of measuring. The quantities of dye in solution are so small that even minor discrepancies may cause differences in colour when a recipe is repeated. A more accurate pipette has been ordered so hopefully this will result in more accurate colour reproduction from the ratios of the stock colours than I have so far been able to produce. I’ll let you know how I get on. Toning cloth for boardslotting using Procion MX dyes. Reproduced with the kind permission of the President and Fellows of Magdalen College, Oxford. Stuart Smethurst, Kemtex Educational Supplies, Chorley Business and Technology Centre, Euxton Lane Chorley, Lancs, UK, PR7 6TE. www.kemtex.co.uk, 01257 230220. Suppliers of dyes and auxiliary chemicals.